About JSON and XML Data Sources – How can we help you today? In this article, you will find information and multiple examples on the following topics associated with working with JSON and XML data sources. In Klipfolio, when you select data from a JSON/XML data source, the selected field’s path, or XPath, is displayed in the XPath editor. In the following image, the XPath of the name object, /player/team/name, is displayed in the XPath editor. Select only this <field name> element. Only one specific <field_name> element is selected. This is equivalent to selecting a specific cell in a table such as CSV or Excel. The XPath editor displays the specific path for example: /player/team/name. Select all peer <field name> elements. All <field_name> elements at this level of the hierarchy are selected. This is equivalent to selecting a column of data in a table such as CSV or Excel. The XPath editor displays the path, for example: /player[*]/team/name. Select all <field_name> elements. All <field_name> elements at any level of the hierarchy are selected. Select all <field_name> elements in this parent object element. All <field_name> elements in this branch of the hierarchy are selected. A JSON or XML data source sometimes requires special handling to access its objects and arrays due to its tree structure with varying branches and sub-branches. This typically involves editing the XPath to specify how to traverse the data hierarchy. Select the last_name field. /player/last_name is displayed in the XPath Editor. Click XPath to open the XPath editor. To select only the first last_name value, Hedberg, change /player/last_name to /player/last_name. To select only the second last_name value, Richard, change /player/last_name to /player/last_name. Click Simple to close the XPath editor. This returns the same result as selecting a specific last_name field and then choosing Selection Option < Select only this last_name element, and is shown here to provide a simple example of using the XPath Editor. An XPath expression is used to select objects based on specified criteria. Select the last names of players on team Winnipeg. Select the last_name object. /player/last_name is displayed in the XPath Editor. This will return all player/last_name objects. says: for all player objects with descendant team/name equal to Winnipeg, select the last_name object. Click Simple o close the XPath editor. Select all objects whose name ends in "name". This example uses the substring (string, start, length) function which returns the characters from string beginning at the start position and ending at (start+length) position. If length is not specified, substring will return the characters from the start position to the end of string For example, substring ('Klipfolio', 1, 4 ) returns 'Klip'. Select any child object of player, such as first_name. This XPath says: for all /player objects, select all child nodes whose names end in name, that is first_name, last_name, nickname. This expression returns Anders, Hedberg, Maurice, Richard, Rocket, Wayne, Gretzky, The Great One. /player/* selects all immediate descendant objects in the “player” array. /player/* selects all immediate descendant objects (denoted by /*) in the second element of the "player" array. JSON objects with names that begin with non-alphabetic/non-numeric characters (as shown in the following data source) cannot be selected directly. Instead it is necessary to manually type the path in the XPath editor. Sometimes more complex XPath manipulation is required to access and align JSON/XML data.The following table summarizes the XPath functions available for modifying an object’s XPath. Note that not all functions are supported for both JSON and XML formats. Select an element at the position specified by index. This function is used when a field name is unnamed and is instead referenced by number. This function is used to “fill in” blanks for an element that is not included in every record. This is useful for data alignment. To fill in the /data/shares/count field for every item in the /data element, specify each level in the path as a 'fieldname' parameter. Note that this function does not work for nested arrays. The kf:names function returns the names of all the fields contained in an object. This is useful when the field names identify categories such as demographics or countries. which returns data shown in the following image. Unnamed fields cannot be selected directly; see kf:element_at in XPath Functions. Field names that begin with a non-alphabetic character cannot be selected directly; see Examples 4 and 5 in XPath Expressions. 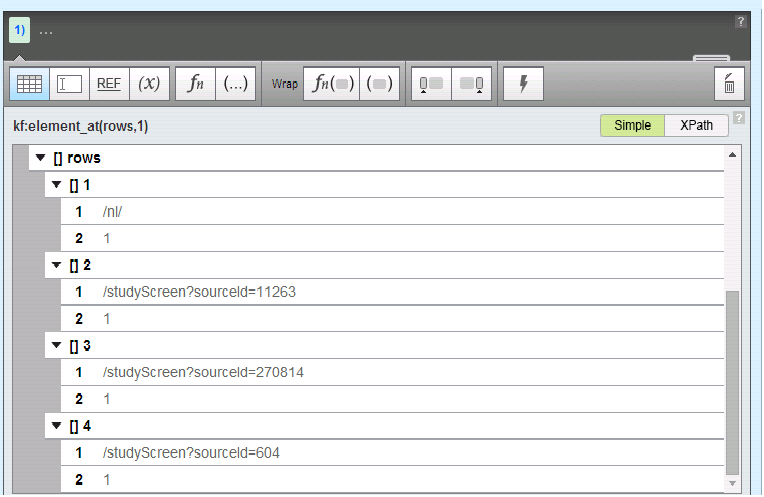 The DATASOURCE and MAP functions can be used together for more flexible XPath editing. selected the last_name for all /player objects with descendant team/name equal to Winnipeg. To select last_name objects matching multiple values, this formula can be extended using the MAP function and the DATASOURCE function. If city= Winnipeg, this formula returns /player[team/name='Winnipeg']/last_name. If city = Montreal, this formula returns /player[team/name='Montreal']/last_name. Note that because the MAP function can return only 1 value for each item in the first parameter, it is necessary to wrap the JOIN function around the CONCAT to convert a list of values to a single, comma-separated value.